savoury – You're Off the List! So my hubby is super picky with his Korean food and he is always endlessly searching for a good Kimchi or Kimchi recipe. 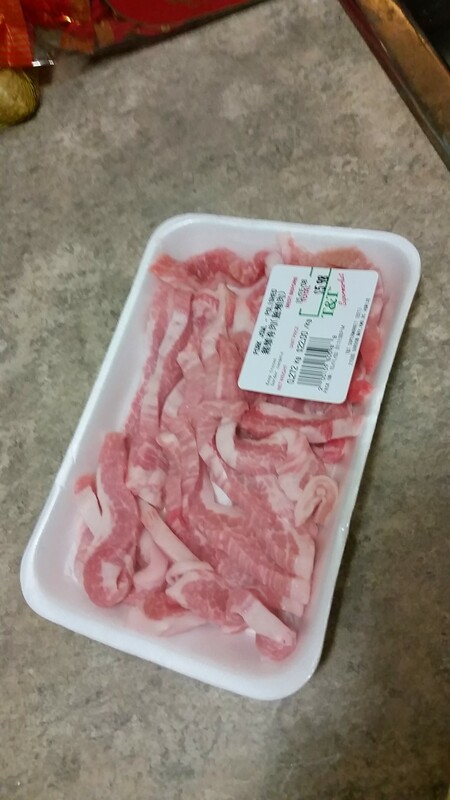 We were at Hmart the other day and he noticed they had a “Premium Kimchi”. Neither of us knew what the premium part was comprised of and what the difference really was. With that being said, we bought it to try. Now if any of you have been to the Korean supermarkets, you know that a lot of times the Kimchi is sold in a plastic jar(about 3 lbs), so there’s quite a bit. 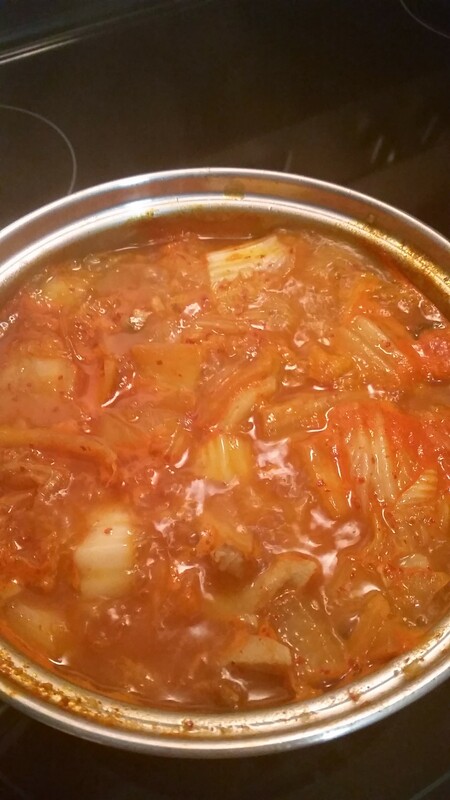 When we got home, we were eager to try this Kimchi out. It’s the type that had the whole cabbages. The tasted was quite nice, not too salty or sour. Full flavour development. 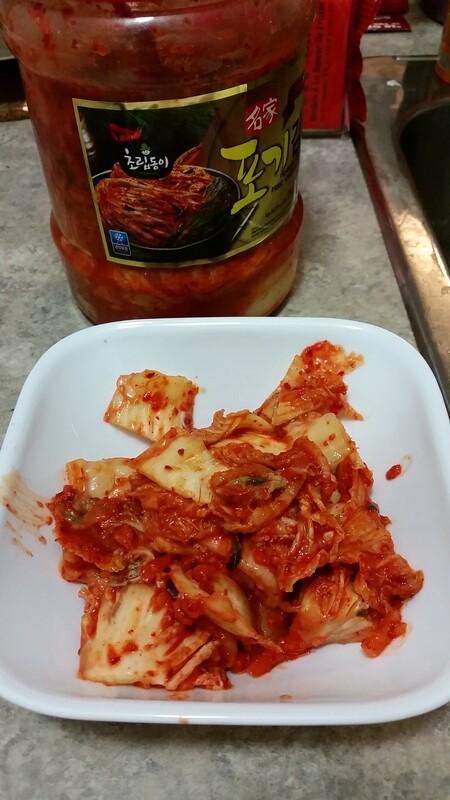 Unfortunately, it’s still not the perfect kimchi my hubby was looking for, and therefore we had a lot left over when we were coming close to the expiration date. I asked my hubby what we should do with that much kimchi and he suggested that with the cold weather we can make kimchi jjigae. 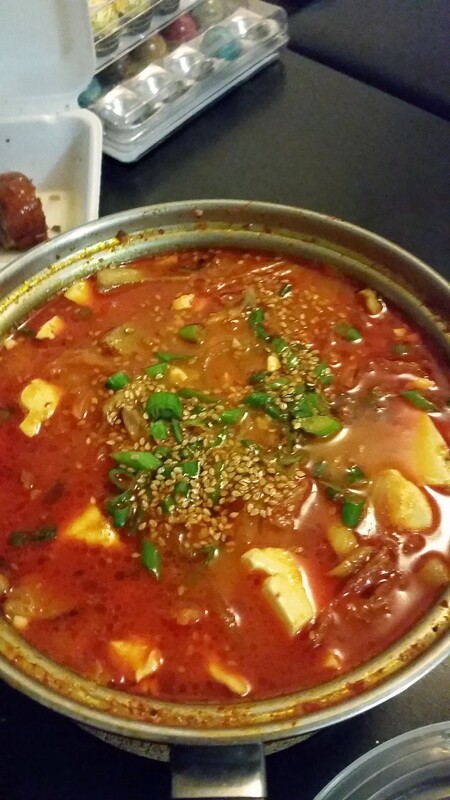 If you can’t figure out from the picture above, Kimchi Jjigae is a stew made of kimchi. I believe traditionally, it’s made with kimchi, water, pork (neck, jowl, belly? 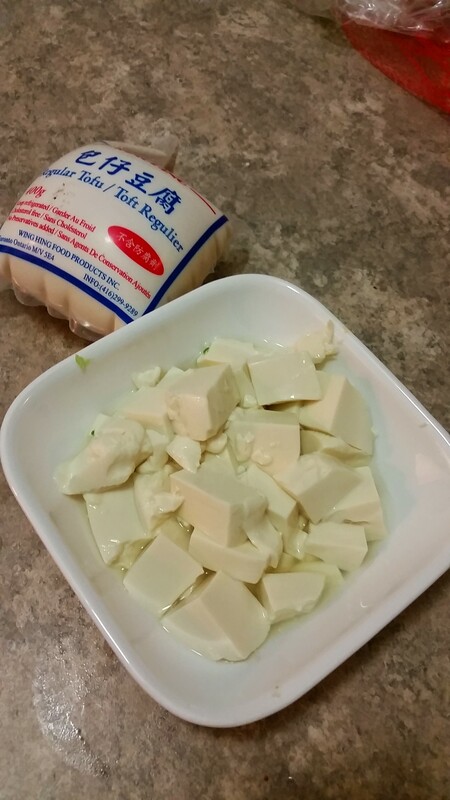 ), salt, green onion, kimchi juice, and gochugaru (Korean red chili flakes). Since I’ve never made this before, I decided to scour the internet that had a recipe and instructions that seemed to make sense. 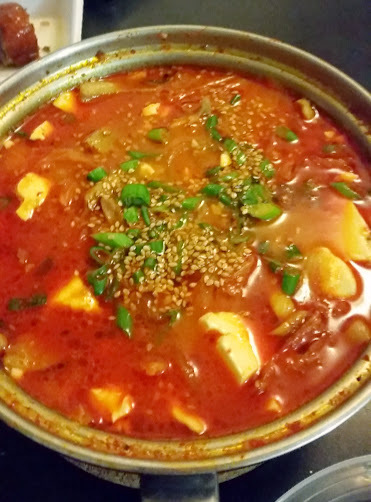 I came across this site: http://norecipes.com/recipe/kimchi-jjigae/. I do appreciate Chef Marc’s take on his site regarding cooking. Sometimes it’s not about the actual recipes and it’s more so the methods of how to develop flavours, lock in juices, proper steps. Well I decided to give this recipe a try, sort of. As you can see, I did a lot of substitutions. It’s the techniques and fresh ingredients that matter in the end right? 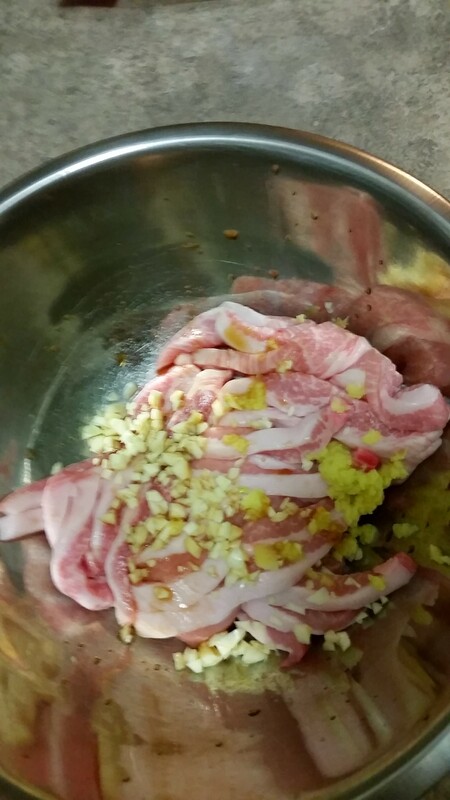 Saute the pork jowl. Add oil and kimchi once meat has slightly browned. Add sesame oil, sprinkle sesame seeds and green oil. Serve and enjoy! Very! Soups and stews generally don’t require too much effort. It’s just the order of putting the items in to ensure the flavour development process. I noticed that there were comments about the pork not being soft. I’ve made this 3 times now and each time the pork has been pillowy soft, so it’s just stewing it with time. I loved it. Made some plain jasmine rice to eat it with. It was hearty, comforting, and hot on a cold winter night. I didn’t add a lot of the chili paste/powders as I can’t take that much heat, but the kimchi we had did have a bit of heat already. The 30 mins cook time noted on the site was pretty spot on. 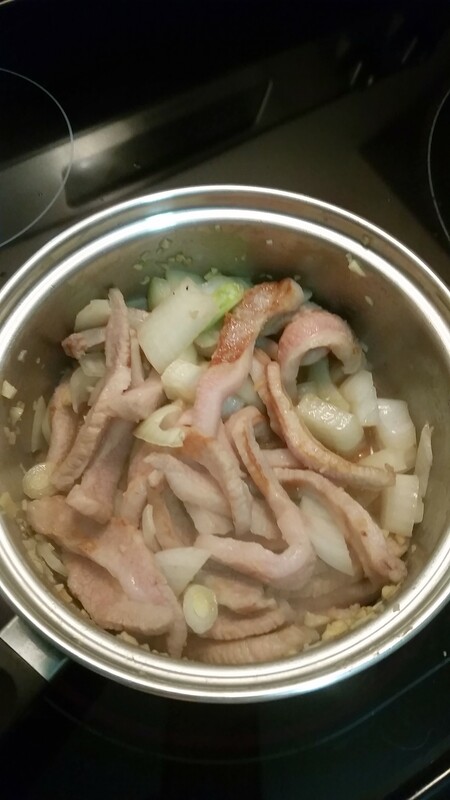 It was enough for the pork and onions to be browned and all the ingredients to mingle and stew. Well as I mentioned above, I made this 2 more times afterwards, so it was wonderful. 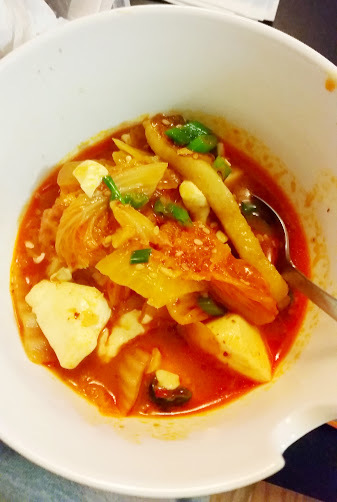 I found this recipe super easy and although I made many changes to the ingredients, with the proper steps and techniques that Chef Marc provided, I was able to make it a pretty good kimchi jjigae. I made it for my mother in law and she said it was “Fancy”, but she did enjoy it. I would definitely make this again on a cold winter day and I would love to try the other recipes on norecipes.com! 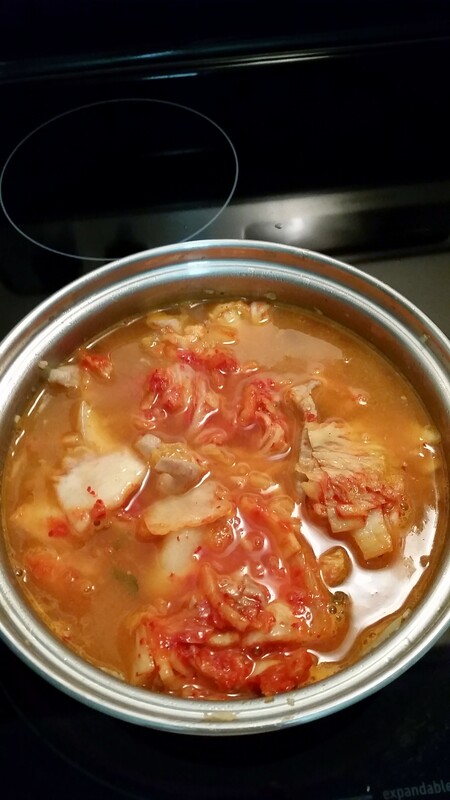 NO Recipe’s Kimchi Jjigae, you’re YOL Approved!